SAN DIEGO, Calif., Feb. 25, 2014 (SEND2PRESS NEWSWIRE) — MCT Trading, Inc. (MCT), a recognized leader in mortgage pipeline hedging and risk management services, announced that its COO, Phil Rasori, will share his insight on an upcoming panel assembled by the Community Mortgage Lenders of America (CMLA), which is designed to address legislative issues and trending that will impact mortgage lending in 2014. The CMLA is a national mortgage banking trade association and advocacy group. Members have direct access to the nation’s top experts on legal and regulatory issues and receive timely and accurate information on new and changing regulatory requirements. The CMLA’s Washington D.C. based lobbying team ensures that small to mid-sized mortgage bankers have a seat at the table with key policy makers regarding how the industry is regulated. The session is entitled “What’s Coming Next from Washington.” It will cover topics such as changes with the Financial Industry Regulatory Authority (FINRA), Consumer Financial Protection Bureau (CFPB), Ability-to-Repay (ATR) rule, Qualified Mortgage (QM), Qualified Residential Mortgage (QRM), GSE Reform, the Dodd-Frank Act, as well as key trending topics. The panel is being held at the JW Marriott Desert Ridge in Phoenix, Arizona on March 2, 2014 from 4:30 p.m. to 5:30 p.m. MT in the Desert Suite III/IV meeting room. * Jeff Kibbey, General Counsel of Century Mortgage and CMLA Board Member. * Phil Rasori, COO of MCT Trading. * Steve Richman, National Spokesperson for Genworth. * Rob Zimmer, CMLA Lobbyist. Mr. Rasori is a recognized expert in capital markets operations in the mortgage banking industry. His areas of expertise include complex financial modeling, computational dynamics, and linear programming for operational optimization. MCT Trading is a risk management and advisory services company providing independent analysis, training, hedging strategy and loan sale execution support to clients engaged in the secondary mortgage market. Founded in San Diego, Calif. in May 2001, the company has expanded to include field sales and support offices in Philadelphia, Dallas, Charlotte and San Francisco. MCT is recognized as a leading provider of mortgage pipeline hedging service and currently supports more than 100 clients on the HALO (Hedging And Loan sales Optimization) Program. MCT also offers a central lock desk service to mortgage bankers that effectively outsources the lock desk function called LockCentral. 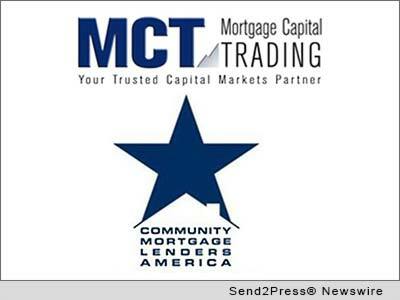 For more information, please visit http://www.mct-trading.com/ or call (619) 543-5111. The CMLA is a national community mortgage banking trade association representing Main Street community mortgage bankers. Founded in 2009, the CMLA is dedicated to providing a voice for the independent community based mortgage banker. The CMLA is founded on the principal that a thriving independent mortgage banking sector increases competition in the industry and provides borrowers with greater choice resulting in lower costs and innovative products. For more information, visit http://www.thecmla.com/. News issued by: MCT Trading, Inc. Original Keywords: Phil Rasori, MCT Trading, Inc., national mortgage banking trade association and advocacy group, Community Mortgage Lenders of America, What’s Coming Next from Washington MCT Trading, Inc. San Diego California SAN DIEGO, Calif.
News Source: Mortgage Capital Trading Inc.
More from Mortgage Capital Trading Inc. Founded in 2001 and headquartered in San Diego, Calif., Mortgage Capital Trading, Inc. (MCT Trading) is a mortgage pipeline hedging and risk management advisory services firm providing independent analysis, training, hedging strategy and loan sale execution support to clients engaged in the secondary mortgage market. Since its founding, MCT has provided training and secondary market services to more than 200 clients yielding stellar results, and currently supports more than 150 clients on its proprietary HALO (Hedging And Loan sales Optimization) Program. RSS News Feed for Mortgage Capital Trading Inc.
REFERENCES: Banking News, Phil Rasori, MCT Trading, Inc., national mortgage banking trade association and advocacy group, Community Mortgage Lenders of America, What's Coming Next from Washington MCT Trading, Inc. San Diego California SAN DIEGO, Calif.